-The implant is placed into the bone without a tooth on it and is allowed to heal for 2-3 months (upper left part of above photo). -A post (called abutment) is screwed into the implant and an impression is made. An appointment is made for a try-in of the final tooth several weeks later. -The dental laboratory constructs a tooth that fits over the post. The tooth is tried in for fit and appearance. Then the tooth is permanently attached to the implant. -Some situations may require more visits than what is described above. We have advanced imaging systems that ensure the best outcome for your dental implant treatment. 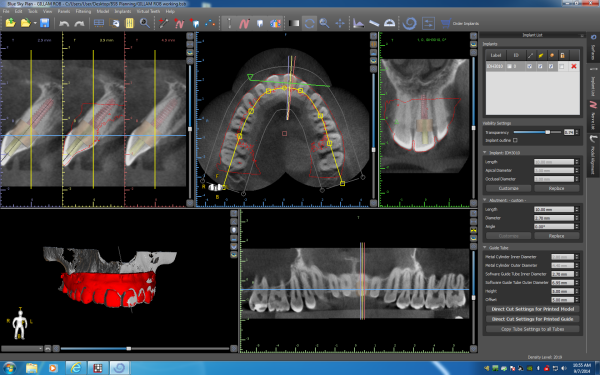 Conventional dental x-rays do not show the detail and amount of information that our CBCT scanner shows.